The tool is available for download at the codeplex site: https://enterpriselogger.codeplex.com/. The entire documentation of the tool and how to use it can be found in the documentation tab in the codeplex site. In case you want to keep reading this blog, I suggest you go back to the link: https://debajitcrm.wordpress.com/2014/06/26/enterprise-logger-for-microsoft-dynamics-crm/ and gather an idea about the tool and what it does. Here we would see how we can log in custom database from CRM just by tweaking the configuration page without even changing a single line of code. Please note that for this to work, the users should have access to the custom database with write permissions to the table where logging would be done. I come back to the configuration page of “Xrm Logger” solution and this time I select “Database” as the logging mechanism. Table name : the name of the table where logging would be done. Log Time – The timestamp when the logging happened. I have a custom database where the logging would be done. I enter all the fields and save the configuration. Please check for the screen shots below. 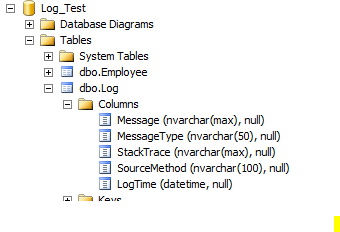 Screenshot for the database where logging would be done. Please note that the connection string is stored in the CRM database Encoded and any user other than the system administrator would not be able to view the connecting string in plain text format. Now I go again in CRM and create an account. And when I query the Log Table the following is the screenshot of what I get. And you have logged in your custom database without changing a single line of code. Hope this would surely help.